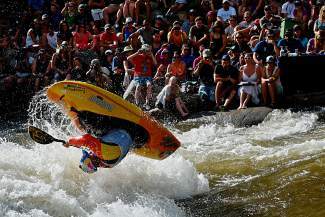 VAIL ­— Preliminary reports show that the GoPro Mountain Games, held in Vail from June 5 to 8, drew record crowds — but hotel staff the villages could have told you that. The weekend was a busy one for lodges, and for the first time, Lionshead Village also saw significant traffic for an event that is usually focused in Vail Village. The Lodge at Lionshead was sold out of the weekend because of the GoPro Mountain Games, said marketing manager Leslie Robertson. The traffic was welcome for a time of year that has traditionally been slow for tourism business. Rob LeVine, of the Antlers at Vail, said he feels the crowds from the GoPro Mountain Games have grown each year. According to early counts, the Games drew up to 58,000 spectators, up from 53,579 in 2013. The two Vail parking structures were both filled by 10:10 a.m. on Saturday, and parking overflowed onto the sides of the Frontage roads. There were 535 cars counted parked on the Frontage Road — as many as any major ski weekend — and that may be a lower estimate judging by how far down the cars were stretched, said Vail Parking Supervisor Kevin Berga. Surprisingly, economic impact stayed about the same or less than this past year — estimates are that the Games generated about $4 million. This past year, final reports indicated $4.7 million was made. Vail Valley Foundation Senior Marketing Manager Paul Abling said the foundation can’t speculate on the economic impact until final numbers come in. Still, the games had a larger vendors village than ever before, and a number of new sponsors including Vasque footwear, Native and Costa eyewear, LifeProof, Redington and KIND. GoPro is contracted to sponsor the Games for at least another year.